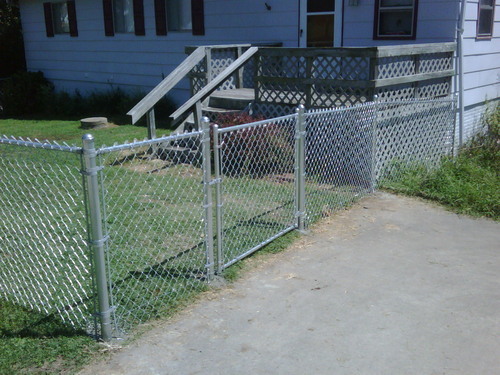 We offer all styles of chain link fencing of any height also in any gauge wire. All fencing and fittings are galvanized for superb rust resistance. We set all posts in concrete and all residential fences come with tension wire on bottom. We also build our own gates to fit your needs. Below are links to pages of Pictures of Residential Galvanized Chain Link Fences we have installed. Residential Chain Link Fence Pictures Pg1. Residential Chain Link Fence Pictures Pg2. Residential Chain Link Fence Pictures Pg3. Residential Chain Link Fence Pictures Pg4.